Well , for those of you that don't already know, the qualifying attempt was a failure but even with that bit of disappointment it was still a great trip. It would have been nice if Margo could have made it. It was her idea to begin with afterall but family commitments kept her from making the trip. 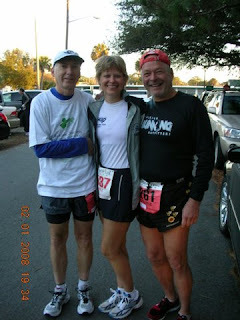 Two of my faithful companions, Karla and Jerry went for fun and to support me. Jerry would be running the marathon and Karla in the half. I was happy to find the drive down wasn't nearly as long as expected. We made it to our hotel on the Interstate in just 4.5 hours and after checking in decided to go over to the Island to pick-up our packets and figure out where we wanted to park the next morning. It would have been nice if I knew the best way. We ended up taking the scenic route with a million stop lights and rush hour traffic making it a most frustrating drive taking nearly twice as long as expected. After picking up my packet I sought a local for directions back but then realized that the car we drove down had a navigation system. Duh! So while they shopped I went back to the car and figured out how it worked. After a few minutes I had our route programmed in and saved a half hour on the trip back. Race day morning looked promising despite the most unpleasant hotel clerk I think I've ever had to see first thing in the morning. We all kind of felt sorry for someone that seemed to be so miserable. But the weather was looking good and the drive back over to the race site was quick and uneventful. We were lucky to find a parking spot only a block away from the starting line. It was a bit cold so we stayed in the car until a half hour before the start and then I went for a warm-up run and made last minute preparations. As we walked to the start, it was sunny and warming quickly. I looked around to see if I could spot any of the MTC members that I expected to be there but didn't see any. I lined up with Karla and Jerry but I would have to race ahead of them today. And then , it was time to go. I planned to start easy and gradually work my way on pace. After just 1/4 mile, I spotted Jay Finkle up ahead. I was tempted to run up to him but I knew he was planning to run even faster than me so I resisted the urge knowing I would get caught up in a pace too fast. I passed through the first mile easily in 8:06, within the range I wanted to be. It was in the 40's now and the air was calm. Perfect conditions for a pr attempt. As the next several miles passed, I could hardly believe how effortless it was to maintain pace. I felt like I was just out for a training run and my splits for each mile were very even, only varying by a few seconds and in the range they need to be. I was sticking with my hydration and calorie replenishment plan and by 10 miles I was finally convinced that I may have a real shot at making it. I had not really been too confident in the last few months. I had been feeling very beat-up and depleted after a hard November and even though I took it quite easy in December, I have still never felt completely recovered . It also wasn't the best thing for me to race at Frosty 50K if I wanted to do my best here. I noticed after 10 miles that although I still felt very good, I finally felt like I was in a race and not just out for an easy run. My breathing was getting a bit deeper and I could feel the effort. Even so, I felt good and was still on pace. Because the Island is so small the course is a double loop and there are several small loops and out and back sections so around the 11 mile point I was able to see some people that were ahead and behind me. I spotted Jay and Anita, Richard Lassiter, Darrell Elliot, John Marrota, John Hutchinson and Charlene Simmons from the MTC. I was a bit surprised to see Charlene . She lived in Chapel Hill but moved to Chattanooga several years ago. I spotted Jerry and Karla who had planned to try and run the first half together and then Jerry would go on to run the second half. He had pulled ahead of her a little but looked like he was struggling. Karla looked relaxed and was running well and by my estimation looked to be running about the pace expected. I passed through the half in 1:46:57, almost exactly where I wanted and needed to be. I was still feeling good but the 13th mile had been a little slow. I just thought maybe I had lost focus so I picked the pace back up a little bit. 14 and 15 were still a few seconds too slow so I decided to pick up the effort again and went through mile 16 in 8:06, right back where I needed to be. It wasn't easy though but I've struggled a little and been able to come back strong before so I wasn't worried yet. But then a quarter mile later I got a side stitch just as I turned a corner and into the bit of breeze that had kicked up. I used every trick I could thing of to work out the stitch while trying to maintain the pace but it didn't work. That mile took me 8:36 and my energy was fading fast. I walked at the aid station and took in some gel and water and headed out planning to try and regain the pace but it wasn't to be. Although the effort was there the pace was not and I was so deflated to pass through the next mile in over 9 minutes. I knew then that the attempt was over. From that point on I just tried to run as fast as I comfortably could and hope for at least a good time. Maybe I could still run a 3:40 . I passed by the start finish area just before 21 miles. and saw Karla. She took this picture and then asked how I was doing. I told her not too good but maybe I could still run 3:45. A couple of miles later and I was still slowing down and thinking maybe 3:50. Still slowing as I passed mile 24 I was hoping maybe I could run 3:55 and at least beat my Richmond time from November. Well, I couldn't even do that And despite the cheering efforts of Scott Foxx and friends from a house along the course I had to do a lot of walking in the last mile. Richard came by me in the last mile running a smooth pace while I struggled along and eventually finished in 3:56:58. Karla was waiting for me at the finish and then I spotted Jay Finkle. He had run a great race and qualified for Boston in 3:18. Anita came in right behind me while I was still in the chute. We walked around to wait for Jerry to finish and a lot sooner than expected he come home in 4:10. Amazing considering how little training he has been doing. Karla ran a strong 200:50 for the half. With her strength and determination I think she will be back in pre-cancer shape within another 6 months. Darrell Elliott got a pr and Boston Qualifier too in 3:29 so I was very happy for him and Jay having successful runs. I got to see Charlene for a few minutes just before we headed to the car to start the long drive home. I enjoyed the race despite not achieving my goal. 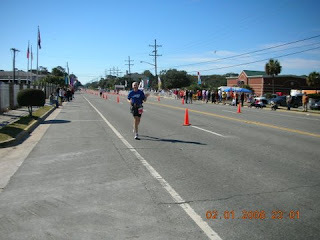 The Savannah Striders and the Tybee Island people put on a nice race. Nothing fancy but well organized and a bargain compared to many other races. I would recommend to anyone to try it at least one time. On to the next one.